Durable lanyards allow for the prominent display of badges and ID cards without damaging clothing. Flat woven, nylon material allows lanyard to lay flat against the body. 3/8 in. wide x 36 in. long. Black. 1/EA. Great product. I've ordered from them several times and have never been disappointed. Quick and efficient service. Welcome to MyBinding Video. 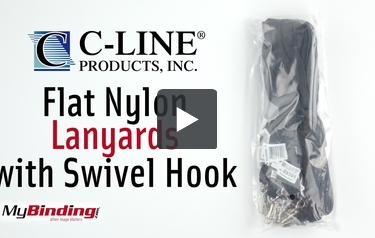 These are the Flat Nylon Lanyards with Swivel Hooks from C-Line. They’re really comfortable, they feel sturdy and the flat woven nylon material helps the lanyard and badge lie flat against your body. The nylon loop is 3/8” wide and 36” long. It has a standard swivel hook at the bottom that can accommodate several badges or cards. These lanyards are available in packs of 100. For more videos and all your binding needs, visit MyBinding.com.